Mobility empowers by extending access to locations not historically accessible by imaging. Visage Ease enables authorized users (e.g., Radiologists, Referring Physicians, Administrators) to have access to imaging results, for example, at the patient bedside, in the department, in the exam room, at the imaging center, at the physician office, at home, or simply out and about. Users who have cellular or WiFi network accessibility on their laptops or MacBooks always have access to Visage 7, but the convenience of accessing imaging from iOS devices (iPad, iPhone, iTouch) breaks down location barriers never before possible in imaging. For example, Visage Ease supports app-to-app integration with EHR mobile apps, enabling authorized users to launch patient images in Visage Ease from the electronic health record, and then returning back to the mobile EHR app. The freedom of imaging access enables communication and collaboration between radiologists and referring physicians, tightening the circle of care without the limitation of prior physical boundaries. Visage Ease is a native app optimized for iOS, and is a free download from the Apple iTunes App Store. 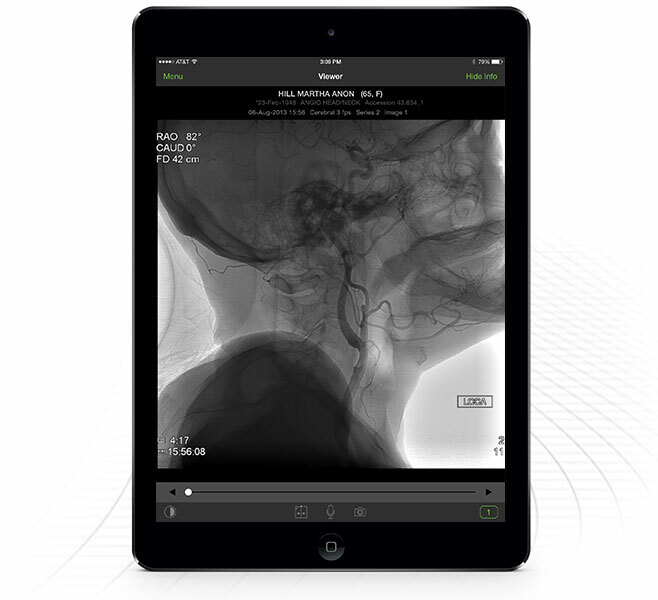 Visage Ease is inherently intuitive, requires no advance training, with only a username, password, and server address required for imaging results access. Visage Ease is a native capability of the Visage 7 Enterprise Imaging Platform and does not require separate server(s) or administration. Visage Ease supports secure multi-factor authentication, and integration to Active Directory. Touch ID fingerprint identification and authentication enables authorized users to rapidly, easily and securely authenticate into Visage Ease with their fingerprint. Visage Ease enables users to locally cache imaging studies, based on user-definable criteria. Caching is a convenient capability for locations and geographies where network or cellular access is unavailable or highly variable. Visage Ease supports Visage 7 server partnering, enabling enterprise-wide study visibility across multiple partnered Visage 7 servers. Visage Ease leverages protocol handler integration, enabling novel App-to-App integration, for example, to mobile EHR and portal apps. Visage Ease supports Apple iOS Push Notifications, alerting users when new studies at the Visage 7 server match study search criteria saved with push notifications activated. REQUEST a TEST DRIVE. Grab your mobile. Go. Learn more. Request a test drive of Visage Ease, and experience the freedom of mobility.